Marinade the lamb with spices (except the saffron), salt, pepper and 3 tbsp of oil and combine well. Place the seasoned lamb along with the onion to a 5-6 quart heavy pot. Place the saffron in a small skillet and toast over medium temperature for 15-30 seconds. Mix it into the wine and leave for 1 minute. Pour the wine and sufficient water to cover the meat into the pot and cook for 1 1/2 hours. 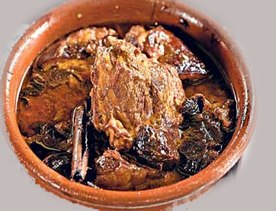 Add the prunes, honey into the pot and allow to cook for 20 minutes until the lamb is soft and the sauce thickens. Adjust seasonings, if required. Place the sesame seeds in the skillet and toast the seeds until golden brown. Pour the balance oil to the same skillet and allow to simmer for a while. Add the almonds and drain on absorbent towels. Remove the cooked lamb from the pot and serve hot, garnished with almonds and sesame seeds.